We were invited to a birthday party of a one yr old fella last weekend and this was on the menu. It tasted so good, I actually ate quite a bit of it. Even Ro for that matter kept going back and taking two or three pieces each time and I had to ask our host how it was made. She said she saw it on Nigella's show and gave me an outline of what it was, and some tips as well. A few days later, I wrote to her asking if she had a concrete recipe and she passed on the details. Exchanged a few emails, googled a bit and there, I was ready to make the yummiest chocolate bar ever! I mean I gasped when I saw the amount of butter it used, but what the hell...when its a one time thing, its OK to go a bit berserk right? I made this a couple of days back and have stored it in an air tight container in the fridge and its perfectly fine. Ro takes it to work for his sweet intake after lunch and I munch on it when I'm desperate for a sugar high. I am thinking this will make perfect 'take to a friends house' gift or do it up it small colourful wrappers and it would be great at parties as well. Place a saucepan on low-medium heat, break the chocolate into smaller chunks, add butter and golden syrup and melt. While that's taken care of, in another bowl break the Crunchie bars into smaller chunks and add the peanuts to it. Add the salt and mix well. Take the chocolate-butter off the heat and stir to check if you have a smooth mix. 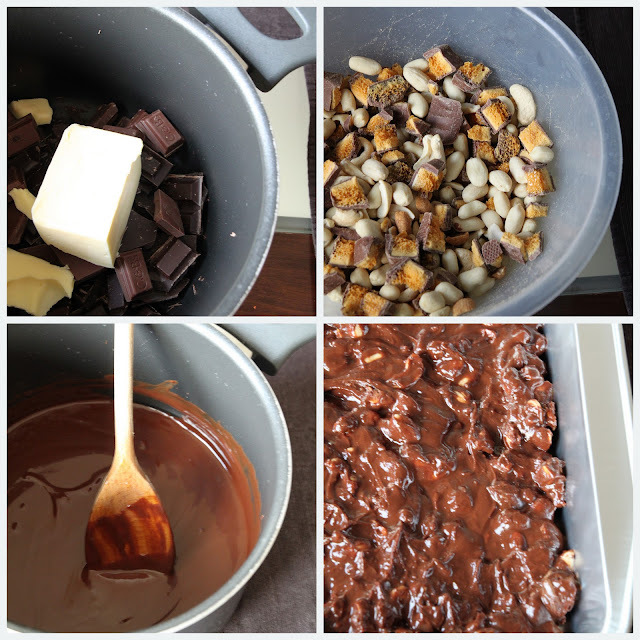 Tip in the peanut-Crunchie bar mix into the chocolate and stir gently to coat the nut mix. Pour on to a foil tray (which is ideal) or on to any baking dish and smoothen it out evenly. After the bars have set well, remove them from the foil tray and cut into smaller pieces and store in an air tight container. Notes: The original recipe calls for salted peanuts, but I was advised that they were a tad too salty and so I went with regular peanuts and added the salt just to get that salty feel. The chocolate too, you can make it all milk, all dark or equal quantities. We prefer dark choc to milk ones, but since I was a little concerned about it being too bitter, I decided to use 100 gms of milk chocolate. Using a foil tray is great because the whole thing just comes off as a large bar and you can chop it up on a cutting board. I love chocolate in any form. Delicious chocolate bars,looks divine,aa photos kandittu kothiyavunnu. Perfect chocolate bars, I too love this a lot. Adipoli snack bar, pine athil uppum madhuraum undu ennu paranjal entha paryauka. what a recipe...love your clicks. so chic and mouth watering. :) reading ur first para i remember the video, that's wat she expressed its hard to stop eating. The day i saw the recipe i wanted to give it a try, procrastination my prime habit! You got just right there, top on earth indulging and eye catching flicks, good weekend beautiful! Delectable! did u use regular choco bars or baking ones? Lovely bar and sounds easy...perfect for a chocolate lover like me. Chocolate = Perfect Bliss !! Best looking chocolate bars ever!!! Looks darn easy and a yum snack.Love the last picture. Very addictive crunch bars, yumm! Those look absolutely wonderful. Wow. This may be decadent, but it is also satisfying! We all need a treat. Thank you for sharing with me. After a very long week, it is refreshing to return to the blogs/people that I love. Your words mean more to me than I can express. Many blessings this week! perfect chocolate bars!! !looks cute n yummmmmmmmmmmy! They looking soo yum yum .. and i like the way you used diff kind of chocolates. Perfect one Nisha... Ialways wanted to make this after seeing Nigella's video.. Was just worried about the storage.. This is easy, pretty and absolutely finger-licking quality snack. You take really good pictures of it. WOW!! 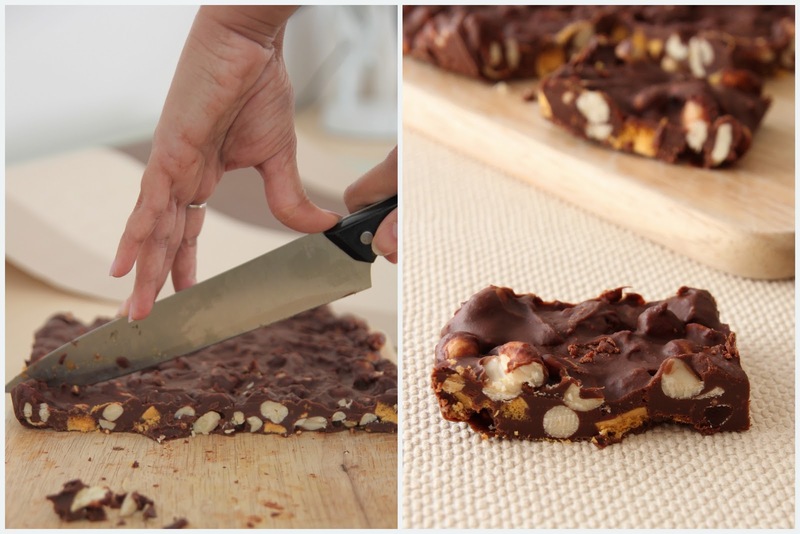 Yummy choco bars..Stunning clicks! Hmm.. delicious! well.. I guess once in a while to go berserk on butter and sugar is okay. :) Who are we kidding? I made some black forest cake today thinking the same.. once in a while is okay. You have a nice friend to have shared the recipe with you. Great recipe, I have to try it for my daughter's birthday! I also have to go back and bake your french yogurt cake again...it was awesome! Those are some really yummy bars! oh no, it's jus tht me no exciting happening person for you to say wow, even if you recognise me...name ginza. roshan will not know...as i said i jus happen to have good memory with names and faces. i was gayathri's classmate in marian before they shifted to corpus...then gayathri and i were college mates in bcm for a while...we marthomites too...yea, everyone knows everyone else in ktm. tht's precisely why i kept an internet moniker :p jus to be on the safer side...otherwise i don think i would've met fresh faces here hehe. now we (you and i) met briefly on a train to chennai. i got down at arakonam...it was the year of our marriage or next, incidentally same year... tht's abt it...don think too hard...not worth it!! right now i'm an overburdened mother of two young girls and my lil alice is trying ever so hard to poop this right moment coz she some constipated!! haha...do i even get to peek at nigella's chocolate...btw fab job you done here! I love Nigella! And again, this looks so YUMMY!! DELIGHTFUL! I make a similar one, but spoon them in to ugly shapeless things for my gals. They love it anyway :-) yours look so professional. Perfect chocolate bars & awasome clicks too Nisha! Hello! This looks wonderful. However, I have never heard of that kind of candy bar and am not sure it's distributed in America - any suggestions for a good substitute? You are wonderful! Thank you! Yay! Hi maria, sorry for replying so late. Hmm you can just omit it altogether. It would still be delicious. Im not sure there is a substitute. Although you can make your own honeycomb, its pretty easy (just google it, replace the golden syrup/corn syrup with honey) and use that as required. Its basically the same thing.